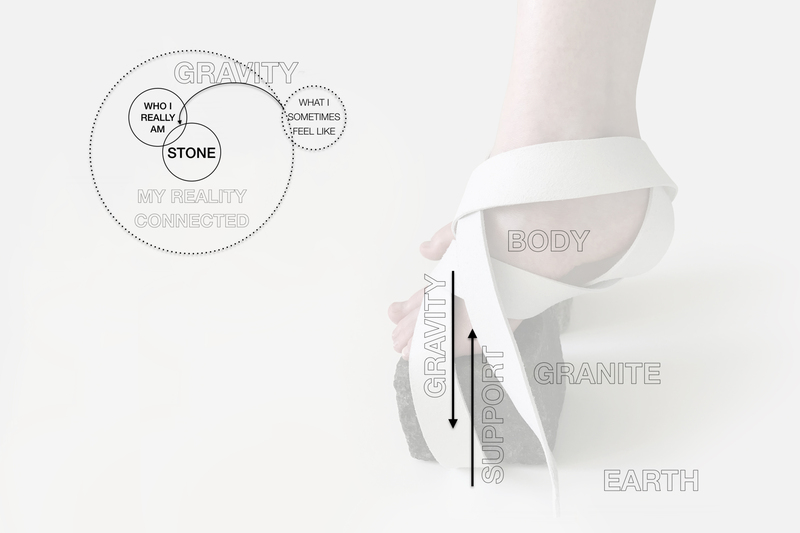 Conceptual granite shoes inspired by the rough stone surfaces of the pavement and walls I encountered during my evening walk. Between the shiny glass and steel it seemed familiar and very real, inviting me to touch. Still warm from the sun, the hard stones felt surprisingly pleasant: smooth and natural, as if touching another skin. It is a local material, very characteristic to Helsinki and all of Finland; the deep underlying geographic structure reflected in urban space. I gravitate towards granite and its natural imperfection. As I push my toes on the pavement stones, they support me — both physically and emotionally. They lift me up. My heels rise upwards, I feel grounded yet lighter. The stone embodies my heaviness; I become more fluid and flexible, more human-like. I am connected, bound, and I want to take this feeling with me. “…it seems to me that […] stone, alive before man was, have the greater capacity to comfort us with the reality of our being.